The Tricolored Juveniles and the Tricolored Adults of our Florida wetlands have been highlighted; and now…. A most lovely Egretta tricolor displays his brilliant breeding colors. 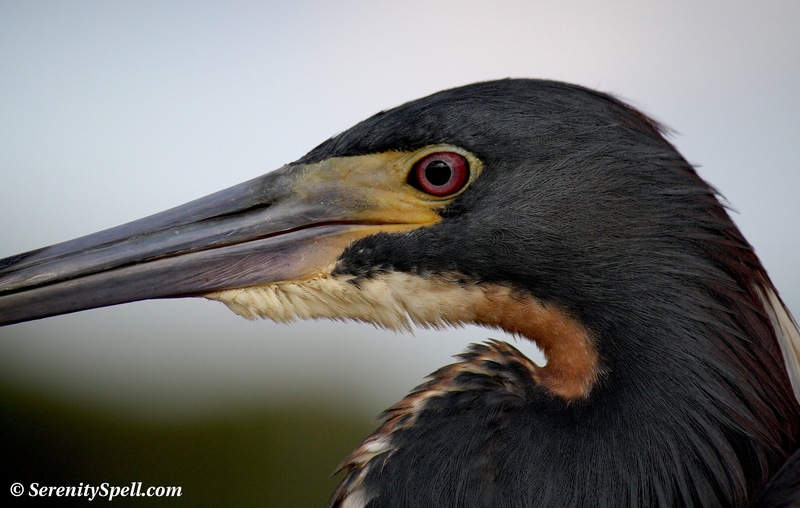 During courtship, these already beautifully colored herons become even more vibrant: the eyes turn a striking scarlet, and the otherwise long, pointed yellow bill turns blue. Breeding plumage involves filamentous plumes on the head and neck, and buff plumes on the back. The juxtaposition of the deep scarlet eye against slate blue feathers is perfect; Nature needs no retouching. Wow! What a lovely bird… I wanna kiss it!! Hah! 🙂 They’re so striking to begin with, but during courtship / breeding, I just love the scarlet eyes against the slate blue feathers — such a gorgeous contrast! They’re delicate things, too. Very handsome bird and a terrific photo! Thanks so much! They’re striking little things — but during courtship / breeding, I just love the scarlet eyes against the slate blue feathers — such a gorgeous contrast. WOW, IT ALWAYS AMAZES ME HOW YOU GET SUCH BEAUTIFUL CLOSE-UPS OF ALL YOUR MODELS IN NATURE!!! BEAUTIFUL WORK!!! THANK YOU!! 🙂 Thanks so much!! We’re so lucky to be surrounded by these critters… If only there were more efforts to preserve the Everglades, or return the land we’ve taken from them. But a telephoto is a MUST, so as to not disturb these guys, for sure!